Properties in Landes average 4.5 out of 5 stars. Property 4: Studio:400M sea lake and centers city, 800 m sea, direct access cycle track. Property 33: Little paradise, at the edge of the Adour 2/10 pers. Superb apartment with terrace. Ideally located 500 meters from the ocean. 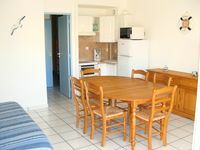 Property 42: Superb apartment with terrace. Ideally located 500 meters from the ocean. Property 49: An idyllic spot near the ocean with lots of privacy, peace, sauna and hot tub. We were visiting the area to see family and were impressed by how well this lovely property suited us, from the kidney shaped pool to the pristine house in the middle of Armagnac country in the Landes region of Southwestern France. Lovely village and rural area. Charming host couple, attentive to our every need. We only regret that we couldn&rsquo;t stay longer. We highly recommend this property and will certainly return there. Nous avons pass&eacute; un agr&eacute;able s&eacute;jour dans l'appartement. La r&eacute;sidence est tr&egrave;s calme. Proche de tout ... Les plages, les commerces et les balades. Merci pour votre location.